The former capital of the Incas, Cusco is today a bustling city that attracts scores of travelers for its ancient Incan remains, Andean culture and Spanish colonial splendors. Small stonewalled alleyways spill onto impressive plazas full of brightly dressed indigenous women, while tucked away are surprisingly excellent museums, quirky nightlife venues, and stylish clothing stores. 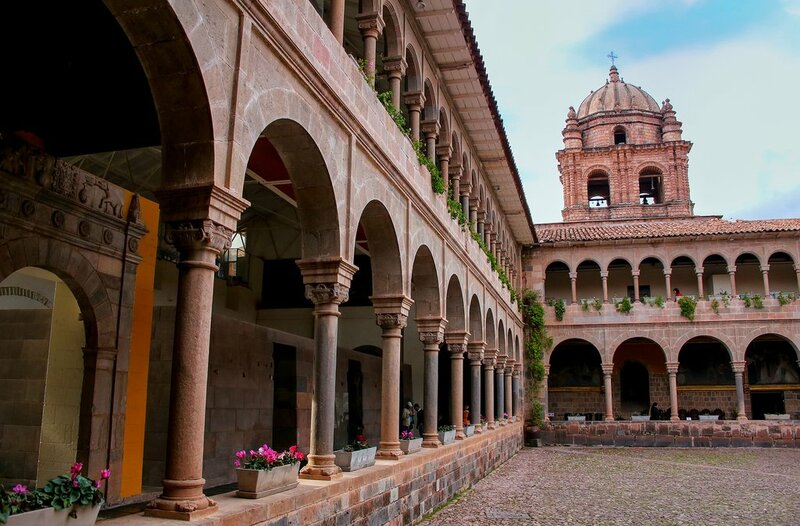 This guide will direct you toward the best Cusco has to offer. 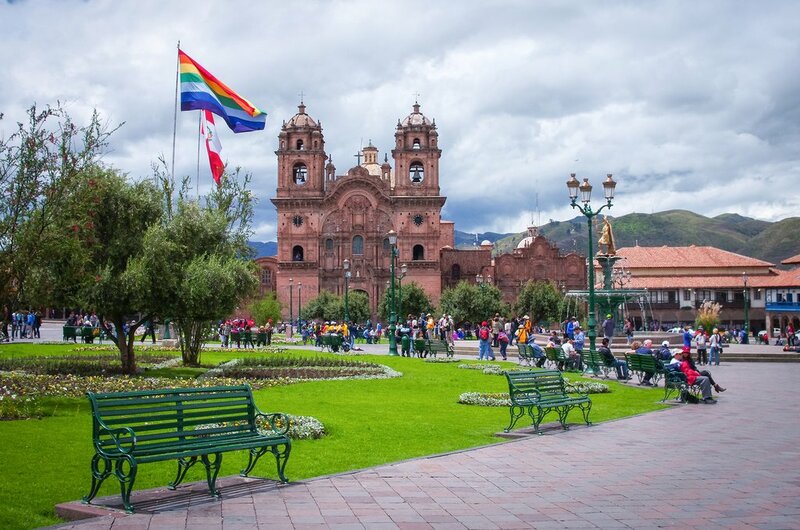 Divided into five areas centered around leafy squares, Cusco was a thriving city when the Spanish arrived in the 16th century. Majestic edifices were constructed from impressive stonework, while precious metals, most notably gold, adorned temples and places of worship around town. The Spanish took over the city, plundering much of its wealth. Today, a number of original Inca buildings remain, most notably the Qoricancha Complex, the city’s most remarkable example of Inca stonework. At all times of the year, Cusco teems with travelers who pass through to reach the continent’s biggest draw: the fortified Inca town of Machu Picchu. Despite the throngs, the city retains plenty of charm. The following list describes how to see the best of Cusco, plus other places and experiences that should not be missed while you visit the city. 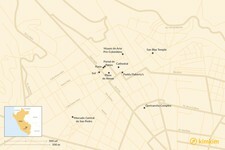 Find a bench in Plaza de Armas and watch the world pass by. At the heart of the city is the beautiful Plaza de Armas, which teems with tourists and locals alike at all times of the day. It’s dominated by the Cathedral, which houses some of the finest paintings of the Escuela Cusqueña, or Cuzqueña School, an artistic tradition that harmoniously combines European devotional art with indigenous colors and iconography. Take a look at The Last Supper by Quechua artist Marcos Zapata, which depicts Jesus and his disciples around an Andean feast complete with a juicy cuy (guinea pig) and glasses of chicha, a fermented maize beverage. Circling the plaza is the Portal de Panes, a covered walkway lined with bustling restaurants, smart shops, and nightlife venues. Sheltered from the rain and sun, it’s a great year-round spot for a stroll. Take a seat at one of the benches on the verdant square and watch the world go by – it’s particularly evocative at sunset when the surrounding buildings are bathed in flaming hues. Courtyard of the Qoricancha Complex. An impressive example of Inca stonework, the Qoricancha Complex was a major Inca temple of worship. Rising from its walls is the Convento de Santo Domingo, a 17th-century Baroque Church that is a telling example of the clash of Andean and Western cultures. Dedicated to the sun, Inticancha (the Temple of the Sun), was once an impressive complex consisting of four sanctuaries and a larger temple. Its location in the Cusco Valley was meticulously planned - every year during the summer solstice the sun’s rays shine into a niche where the Inca emperor was once permitted to sit. Its exquisite interiors once glistened with precious metals, with gold panels, solid-gold altars, life-size gold figures and a large golden sun disc worshipped by the Incas. Sadly, only the Inca masonry survived; the Spanish ransacked the temple, melting down its gold and using the stonewalls as foundations for the Convento de Santo Domingo. 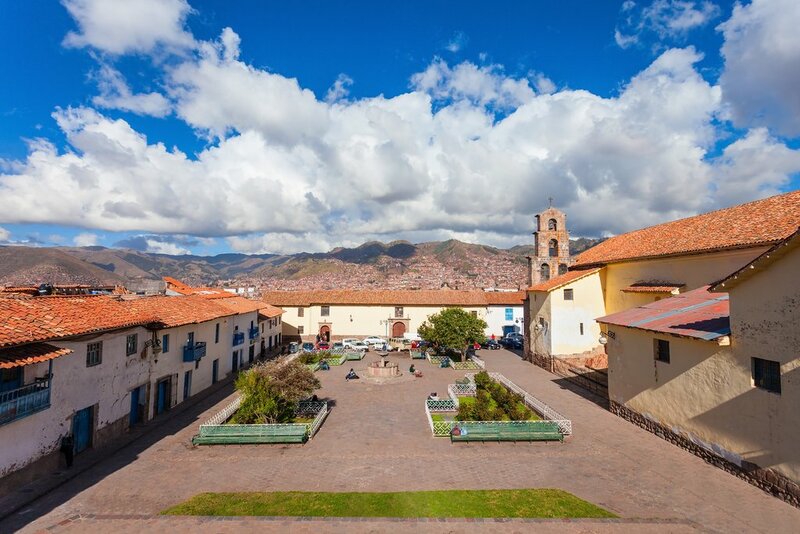 View of San Blas Square in Cusco. 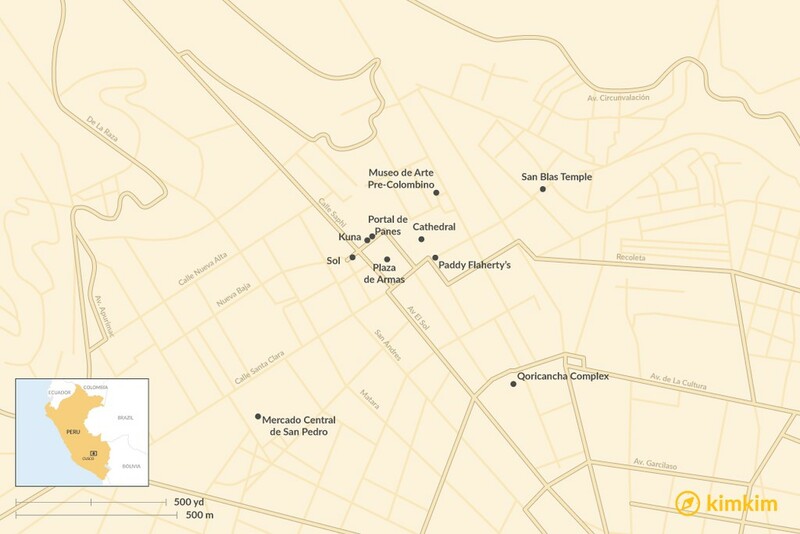 A short uphill walk from Cusco’s Plaza de Armas, the Barrio de San Blas is one of the city’s most attractive districts. Its beautifully restored buildings house artesanía workshops and stores where you’ll find high-quality crafts, many produced in front of your very eyes. Artists’ studios and artisan workshops line the cobbled streets, while sprinkled here and there are attractive hostels and quaint little restaurants serving traditional Andean cuisine. Not to be missed is the tiny Templo de San Blas, whose highlight is an intricate pulpit carved in Spanish churrigueresque style from a block of cedarwood. It’s considered by many to be the finest example of wood carving in the Americas; the pulpit’s craftsman remains unknown. Artefacts housed in the Museo de Arte Pre-Colombino. Located in the Casa Cabrera, an impressive 18th-century Spanish colonial mansion, the Museo de Arte Pre-Colombino displays a wonderful collection of archaeological artifacts dating from 1250 BC to 1532 AD. 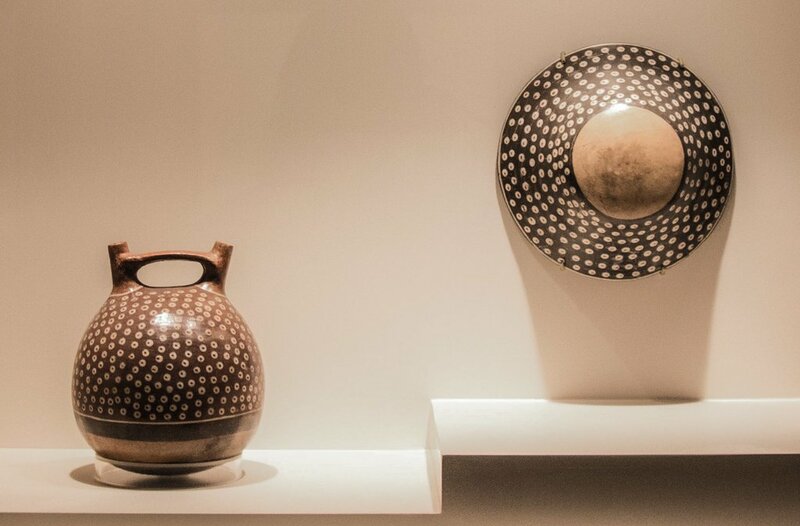 Displayed in chronological order, the exhibits were selected among thousands of objects held in storage at Lima’s Larco Museum. Beautifully displayed, with explanatory panels in Spanish, French, and English, the exhibits highlight the very best achievements of the country’s ancient cultures. Rooms are dedicated to some of Peru’s greatest civilizations, while others bring together the best of woodwork, jewelry, silver, and gold. Temporary exhibitions are also frequently held at the museum. The sprawling Mercado Central has a plethora of stalls selling anything and everything from exotic foods (frogs anyone?) to herbal remedies from the jungle. You’ll find plenty to keep you perusing for hours: clothes are displayed alongside crafts, knick-knacks, fruits, vegetables, and sacks of coca leaves – to name a few. If you’re on a budget this is a great place to grab a meal, with some of the cheapest street meals on offer. 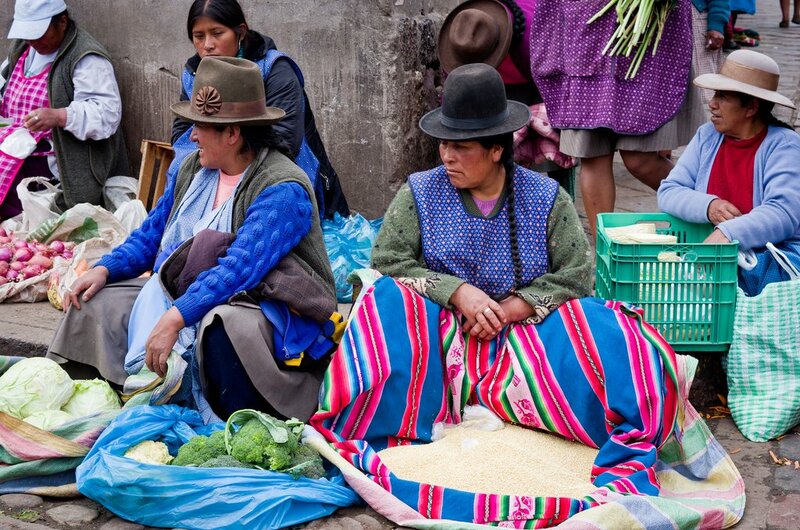 Take a seat at one of the stalls and tuck into local dishes prepared with seasonal produce from the Sacred Valley. Smoothies and juices made with exotic fresh fruits are available too. 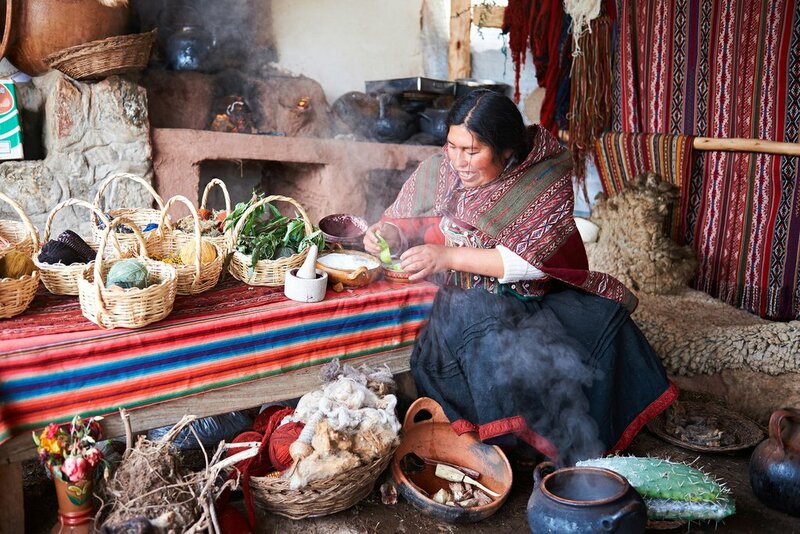 An indigenous woman in Cusco working with natural dyes to create clothes from Alpaca wool. 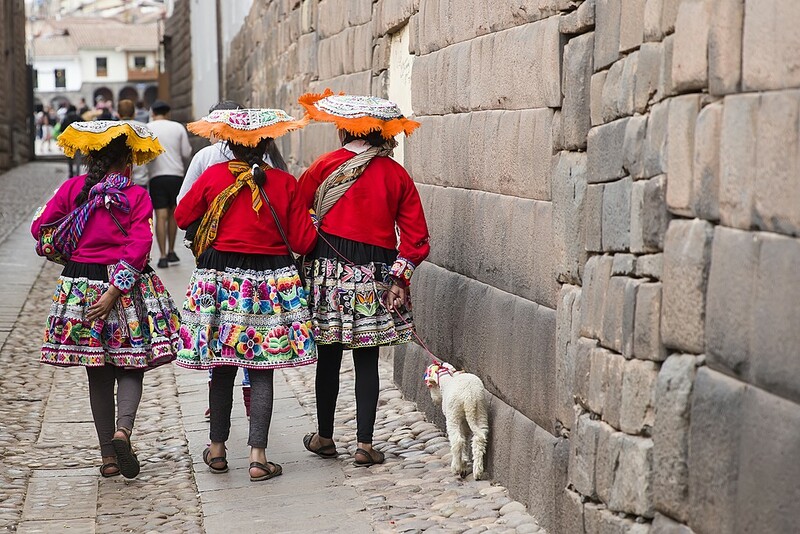 The center of Cusco is home to scores of shops claiming to sell authentic alpaca and vicuña clothing, although beware – many sold on the streets and in shops are made of synthetic material. You’ll have to head to a store that specializes in alpaca clothing. Among the most famous are Kuna and Sol, both chains with stores nationwide. Quality is high, and designs are stylish and fashionable. Prices are high too, although it's still much cheaper than what you’d pay back at home for genuine alpaca wear. You’ll find knitted and woven clothing along with a range of accessories made with fine Peruvian fibers. Look out for alpaca and vicuña-wool sweaters, shawls, hats, blankets, scarves, and gloves. 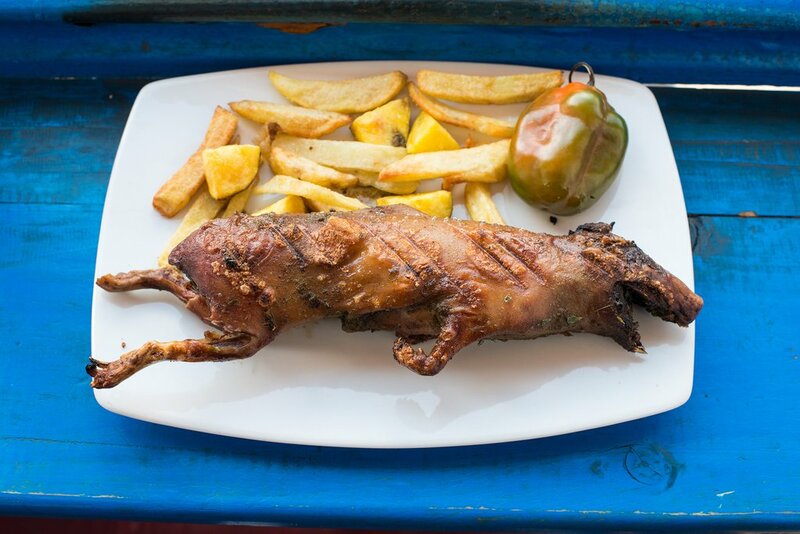 Guinea pig (cuy) and chips is a popular menu item in Cusco. Rated among the best in the world, Peruvian cuisine has taken the world by storm in recent years. 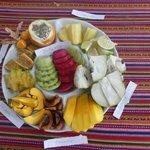 High up in the Andes, the country’s chefs aptly combine innovative recipes featuring international influences with a range of indigenous ingredients, creating a unique cuisine – novoandina - that bursts with flavors. Cusco is a real haven for foodies, with a plethora of restaurants to suit all budgets, from cheap and cheerful backpacker eateries to elegant restaurants run by some of the world’s most renowned chefs such as Gastón Acurio. The Andes’ most popular dish is undoubtedly cuy, guinea pig, traditionally served deep-fried (cuy chactado). Certainly a dish for adventurous eaters, it is often presented with its legs splayed out. If you’d rather try cuy enhanced with a few spices, head to Indian restaurant Korma Sutra on Calle Tandapata for a crispy tandoori guinea pig. Sitting at a height of 11,151 ft, the former capital of the Incas nestles in a highland valley surrounded by soaring peaks, many reaching over 19,000 ft. While it’s not as high as Bolivia’s La Paz, Cusco does lay claim to being home to the highest Irish owned pub on the planet. 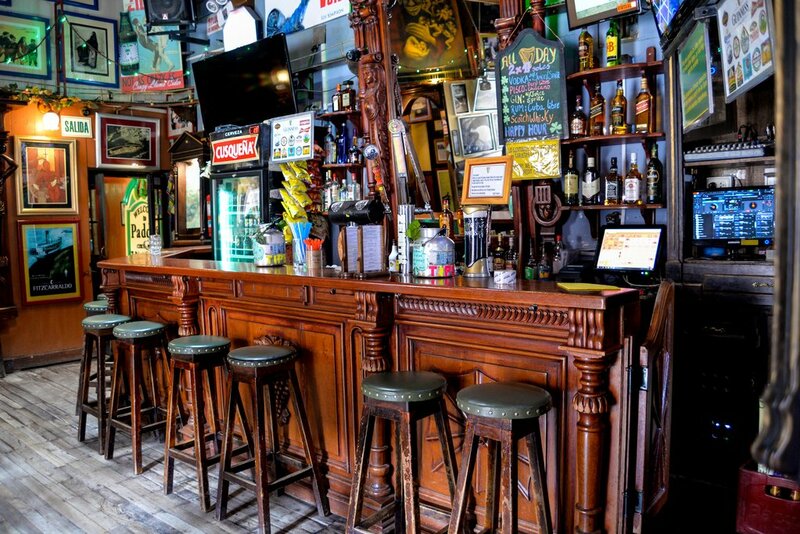 At 11,156 ft, Paddy Flaherty’s on Calle Triunfo attracts travelers for its cozy wood-paneled interiors filled with pictures and Irish curios. While you won’t exactly be mingling with locals here, it’s a great place for some good old comfort food – all day Irish breakfasts, shepherd’s pie and cheeseburgers all feature on the menu, and Guinness is, of course, on tap at all times of the day.